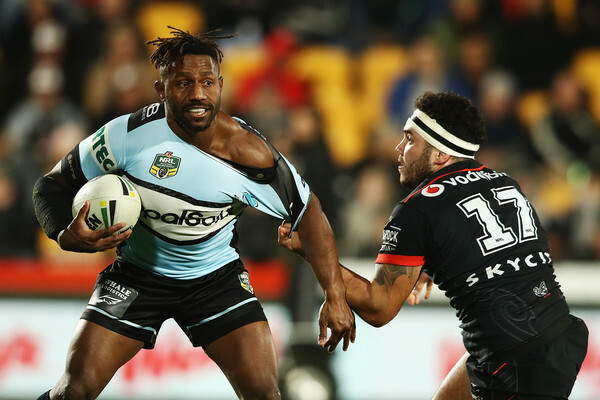 After what has felt like an eternity the Warriors returned to Mount Smart Stadium on a chilly Friday night to play the Cronulla Sutherland Sharks. A win here would solidify the Warriors position in the top four, but unfortunately, it wasn't to be as the Sharks came out on top with an 18-15 victory. Ok, first things first, before I start my review I will mention the elephant in the room, yes the last try was scored off a forward pass. The refereeing in this match was extremely poor, but I do not want to sit here and blame the officials for the results so I will leave that for a discussion in the comments. The Warriors had plenty of opportunities to win this match and unfortunately could not convert them all. This match wasn't all doom and gloom though which leads me to my positives from the game. I don't have too many positives but the Warriors started this match in earnest, making metres at will and forcing the Sharks to make errors, they took advantage of these errors and scored quickly. They weren't able to keep the pressure on, but I think if they had a few more of their regular side out there it might have been different. 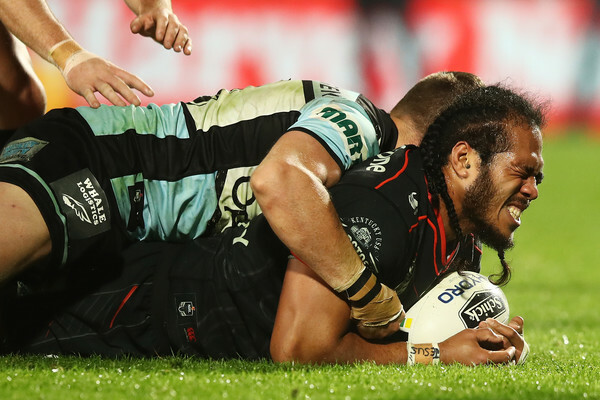 With a 10-5 penalty count, the Warriors were in this match way more than they should have been, the desperation they showed on defence at times must be commended with my highlight being Roger Tuivasa-Shecks try-saving tackle followed on the very next play by Roger throwing himself on a grubber stopping another potential sharks try. I also liked that the Warriors stayed in the fight, all of the Warriors losses this season have been by large margins and with playoff football looming they need more tough encounters. Yes, they didn't get the win this time, but I'm hopeful that they will learn from this battle and overcome any adversities they face in the oncoming weeks. My last positive is that the Warriors will welcome back David Fusitua, Ken Maumalo and Adam Blair for Round 17's must-win clash against the Penrith Panthers. The Warriors missed Ken's big runs and David's finishing ability and im sure they will be itching to get back out there. There was a lot of issues I had with this performance though which leads me to my negatives. After being stuck defending for repeated sets, the Warriors let themselves down by making too many errors or giving away silly penalties. Every time the Warriors made an error it depleted all their momentum and put them straight back on the back foot. The gameplan wasn't sound either, too many times the Warriors kicked early and directly to Valentine Holmes who is an excellent counter-attacker. If kicking early was meant to work they needed to target the open spaces or the sidelines. At times the Warriors looked lost on attack, shellshocked even, when they had chances to score they failed. This could just be down to the changes in the backline, and this may all be fixed by next week, so it is just a case of wait and see. My last negative is more injuries with Bunty Afoa and Tohu Harris succumbing to a dislocated elbow and knee injury. I am unsure how long Bunty will be out for but word has come out the Tohu may miss up to a month. Both players will be sorely missed, and I hope they return sooner rather than later. I assume that Sam Lisone will come in for Bunty and Adam Blair and Tohu will just swap, with Simon Mannering moving out to the edge and Blair moving to lock. The Warriors can fix all of the issues I have addressed above and im confident that the lessons learned on Friday night will strengthen this side mentally when they return to the playoffs this season. My Warrior of the game goes to Agnatius Paasi. Paasi truly embodied the term Warrior in this match, he ran with intensity and threw himself into all facets of the game, defending well and even charging down Matt Moylan's field goal attempt. With Bunty getting injured Passi stepped help and carried the extra load. His kickoff returns were my highlight of his performance. I was happy with the news of his signing last year, and he continues to impress me each and every week. If the rest of the prop rotation could bring the same intensity to each match the Paasi does the Warriors will have a formidable pack. My Warrior that needs to improve goes to Jazz Tevaga. Jazz is always trying when he is out on that field; you can not fault him for that. However, I feel he is out there for too long and when he is out there for an extended period he starts to make more and more errors. If the Warriors use him in shorter bursts, I feel that he would have a more positive impact on the game. For a player of his stature he is defensively sound and a solid runner with the football, he just needs a bit of refinement which Im sure will come in time and with some better player management by the coaching staff. Round 17 will see the 5th placed Warriors travel to Penrith to face the 4th place Panthers. A win here will see the Warriors return to the top four; a loss could cement the Warriors to the bottom of the top eight for the remainder of the season. This competition is so tight this season, and every game is indeed a must win. Losing two of their best performing forwards is not ideal at this time of the season, but the return of their rampaging wingers will make up for that. The Warriors have suffered defeat five times this season, but unbelievably only one of those losses have been on Australian soil. I think this Warriors luck across the ditch will continue with a win over the Panthers and I'm picking the Warriors to win by 12. Before I go, I just want to mention Albert Vete's release. Albert is a talented young prop, and I thought his future with the Warriors was going to be fruitful. It hasn't worked out that way but im happy that he is getting a fresh start with the Storm and I know that they will bring out the best in him and who knows maybe he will return to the Warriors one day like so many others have. So that was my take on a disappointing round 16 performance, and as usual, I will leave you with some questions. What is your opinion on this games refereeing? How do you feel about Albert Vete's release? Who has been your Warrior of the season? What is your score prediction against the Panthers?